To him, it is about winning no matter the method and at what cost. It’s no wonder that his followers think and act the same way. 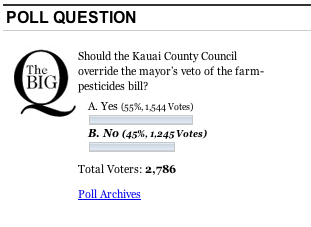 So here is the poll as of 8:40 HST noting that all the A’ole GMO groups have jumped on it. That’s an honest politician indeed who did not allow for the release of the attorney general’s review of the law. Instead he kept people in the dark about it and when the Mayor made his veto, it was clear that the law had no standing based on current regulations. If Hooser and Bynum knew this already, why did they not withdraw the bill and save us all the drama that followed? Wouldn’t a true leader have done the right thing? Apparently in this case, there is no right and wrong, it’s all about winning while dividing communities. Well, we know he’s like Dr. Seralini and the lumpy rat study. They skew the data, give partial information, all as a means to create hysteria to gain supporters. That apparently is the pono way to do things on Kauai for a “leader” like Hooser. 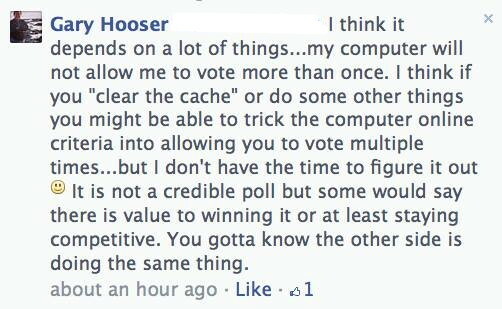 That is not how we local people do things Mr. Hooser! This entry was posted in Local Values, Local Ways and tagged Gary Hooser, Genetically modified organism, GMO, GMO Free Kauai, Hawaii, Hooser, Kauai, Kauai County Hawaii, Mayor on November 3, 2013 by hawaiifarmersdaughter.